It is one thing to be the richest family on the block… it`s quite another to flaunt it successfully. 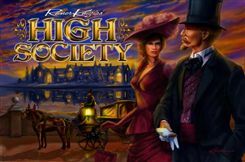 High Society pits you against your neighbors in a race to reveal the most blue-blooded family in your midst. To win, you must acquire all the trappings of great wealth, avoid as many of the pitfalls as you can and still walk away with a huge pile of cash at the end of it all. This Reiner Knizia classic makes a great travel game and an easy one to introduce to friends and family. Players bid against each other to acquire the various trappings of wealth, namely the ten luxury possession (positive-number) and three 2X multiplier cards; while avoiding its pitfalls represented by three cards altogether, including the gambling (-5) card; the thief (lose a possession) card; and the calamitous fire (lose ½ the value of all your possession cards) card. While bidding, though, players must keep an eye on their remaining cash – at the end of the game, even though all those positive-number cards might add up to a win, the player with the least money isn`t even considered for victory. This dual-objective creates a nail-biting auction experience, and one that will surely become a favorite edition for a generation of gamers to come.